"As they rise by the side of my kayak, water rolls from their blubber, as if receding from a sandy beach". Humpback Whales are found throughout the world's oceans. It is believed; due to the different seasons separating the northern and southern hemispheres - they do not cross the equator; which creates somewhat of a biological barrier. When North Pacific Humpback Whales feed in the nutrient rich feeding grounds of the Northern Latitudes, Humpback Whales in the Southern Hemisphere are mating and giving birth in the warmer waters closer to the equator. Deep breathing. Filling their lungs to their capacity before sounding. 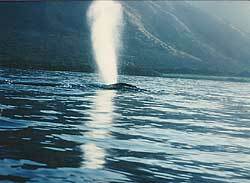 Humpback Whales will exchange more than 2500 gallons of air in less than two seconds. Warm blooded, air breathing mammals just like ourselves. The sun, stars, polarity of the earth, along with warmer ocean and current temperatures, are the natural means in which whales find their migration routes of thousands of miles, primarily underwater. They surface, only to breathe and rest upon their weightless environment. Observations of North Pacific Humpback Whales from my ocean kayak since 1975 indicate the importance to the sense of Touch. Rubbing and touching each other is a frequent occurrence. The sense of touch creates a bonding and security. There is much we as a human species can learn from other species. Their blubber is an organ; it not only keeps the whale warm, but is also their source for energy, (food) during their migration to their mating and birthing grounds. It is estimated that a whale will loose approximately 4-6 tons of their body weight during their annual migrations. 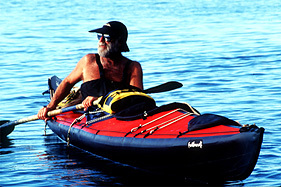 Throughout the night I drift in my kayak between the Hawaiian Islands of Maui, Lanai, Molokai and Kahoolawe. Complete silence is broken only by the romantic sounds of whales breathing and singing. Journals from whale men, noted that dangers of sailing the world's oceans, were not uncharted seas, icebergs or storms - but whales - literally tons of whales. 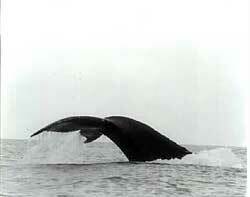 Their populations have dwindled tremendously since the early whaling days of the 17 & 1800's. Chief Seattle, 1854 "All things are connected like the blood that unites us all. Man did not weave the web of life, he is merely a strand in it. Whatever he does to the web, he does to himself".